The experienced commercial realtors at Austin Tenant Advisors specialize in representing the best interests of buyers and tenants in the Search, Selection, Negotiation, and Occupancy of Office, Retail, Industrial & Warehouse Space for lease, rent, or sale in and around Travis, Williamson, Hays, Bastrop, & Burnet Counties, which are the 5 largest counties in Central Texas. We serve the surrounding cities such as Pflugerville, Round Rock, Georgetown, Leander, Cedar Park, Lakeway, Bee Cave, Sunset Valley, Dripping Springs, Buda, Kyle, San Marcos, Burnet, Marble Falls, and more. 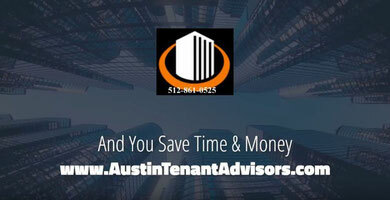 We work with small businesses and startups who are leasing commercial space for the first time and existing companies who are considering a lease renewal, lease extension, expanding, or relocating their office altogether. When you need a great commercial real estate agent on your side that only specializes in tenant and buyer representation, call us today! Our Service is FREE!